When Adlai Stevenson first ran for president in 1952, I was a young kid who knew little about political candidates or elections. I do recall that many in my family, and in our neighborhood, favored Dwight Eisenhower. Ike was -- after all -- a war hero and a frequent visitor to Augusta, my hometown. But, for me, Adlai Stevenson quickly emerged as the most likable candidate simply because of the photo you see next to this column. There he sat.... a sophisticated, articulate intellect.... running for the most powerful position on the planet.... with a big, ugly hole in his shoe. Here was a grown man dealing with an issue a young boy could relate to. The photo obviously impressed a lot of grownups as well. William Gallagher, the photographer, won the 1953 Pulitzer Prize for that picture. That one photo did wonders in humanizing the aristocratic Stevenson for the masses, and assuring that he would be the Democrats' candidate again in 1956. Stevenson.... who died 41 years ago (July 14, 1965).... was an interesting man. He was linked romantically with actress Lauren Bacall, and with Washington Post icon Katharine Graham. He was far ahead of his time when it came to, what we now call, global warming.... though -- back then -- he was probably referring to the fear of atomic bombs. "You and I are fellow passengers on the spaceship we call earth. We can blow it up. We can annihilate the thin envelope of soil on which our nourishment depends, and contaminate the thin envelope of air we breathe." He went on, "We are dependent on the same finite quantities of air, earth, water and yes, I will say, the love that we can give one another." Once, when a supporter said to him, "Governor Stevenson, all thinking people are for you!".... he answered back, "That's not enough. I need a majority." 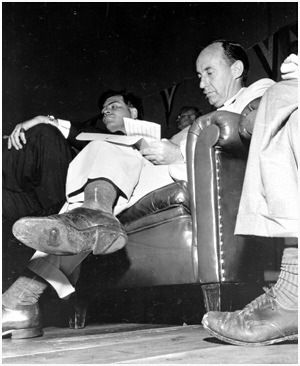 It's strange that, for all his accomplishments, Adlai Stevenson may be best remembered for a simple hole in his shoe. 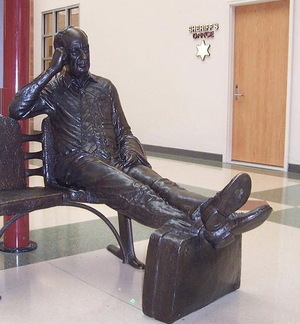 In fact, the second photo shows a bronze statue of Stevenson in the Central Illinois Regional Airport near Bloomington, posed as though he's waiting for a flight. If you look closely, you'll see the sculptor included a hole in his shoe. If you want to impress the young folks, be photographed with a hole in your shoe. But also keep in mind.... Eisenhower won.